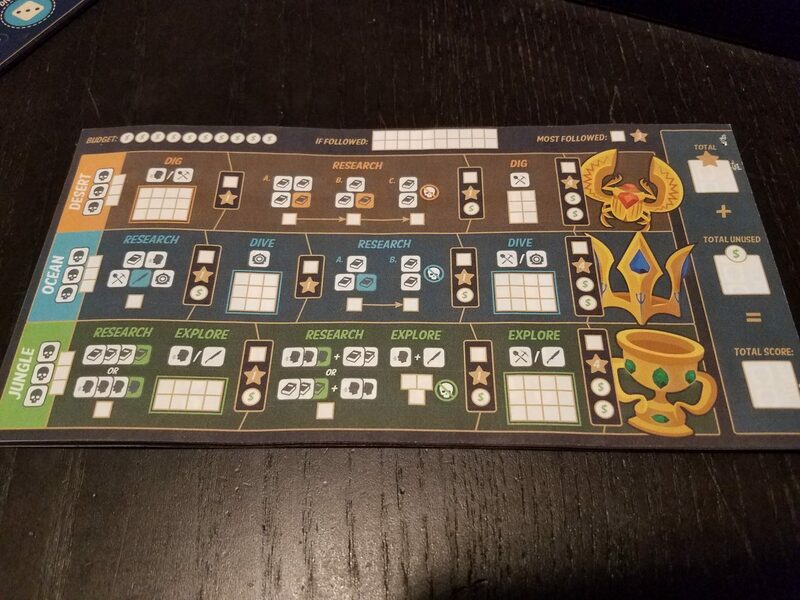 Ancient Artifacts is a clever combination of roll and write and press your luck mechanisms with some really clean, attractive art to tie it all together. Though the randomness can sometimes bite you hard, there is still plenty of decision-making to be enjoyed here. There are few themes that are as full of pulpy goodness as ‘explorers in search of lost treasure’. A generation (and generations since) of people fell in love with the Indiana Jones franchise, and it and stories like it have provided a wealth of inspiration to game designers for decades. Up on Kickstarter now, Ancient Artifacts clearly draws from this pedigree of classic source material, merging it with, ironically, one of the newest darlings of the board game industry – Roll & Write. So do these two great tastes taste great together? Well put on your hat, grab your whip, and let’s go find out! Mechanically, Ancient Artifacts is a press-your-luck set collection game. Each turn, players will draw some dice from the bag, roll them, and decide where they will be assigned. These colored dice, appropriately called Action Dice, will be placed on the Atlas Board to determine which action the active player will be rolling for. The right dice for the job. Once an action is selected, the active player will then roll all the ‘results’ dice as they try to collect the necessary set of symbols for whatever segment of their career sheet they are currently working on. The career sheet (where the ‘write’ part of this roll and write takes place) is a trio of tracks, each leading to the discovery of some presumably ancient artifact. 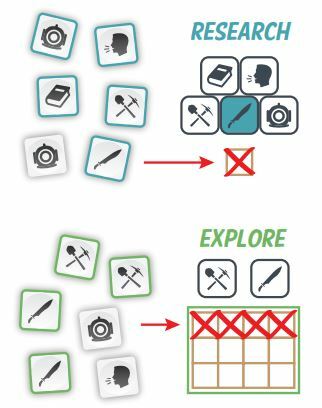 To move along these tracks, players will need to explore, dig, research, and dive, each done by collecting different sets of Results dice. Each success will earn them some Renown (as well as cash useful for purchasing re-rolls), and the player who earns the most Renown by the end of the game is the winner. Jess: So I’m a huge fan of the source material – I love pulp adventure stories, and I still want to be Indiana Jones when I grow up. So while the theme of Ancient Artifacts is really pretty pasted on, I still appreciate it. The aesthetic is really clean and crisp, too. The active player rolls the Results dice, aiming for whatever combination of symbols they need to advance. Some sections, like Explore, Dig, and Dive, need cumulative successes and can be worked on over the course of several turns, whereas Research almost inevitably requires an exact match of the dice on a single turn. Andrew: Now, while every player is on their own, to keep the game interesting, players who aren’t rolling the dice can choose to follow the active player, benefiting from their rolls. However, it’s important to be mindful of this mechanic, because the player who was followed the most gets bonus points at the end of the game, possibly swinging it in their favor! 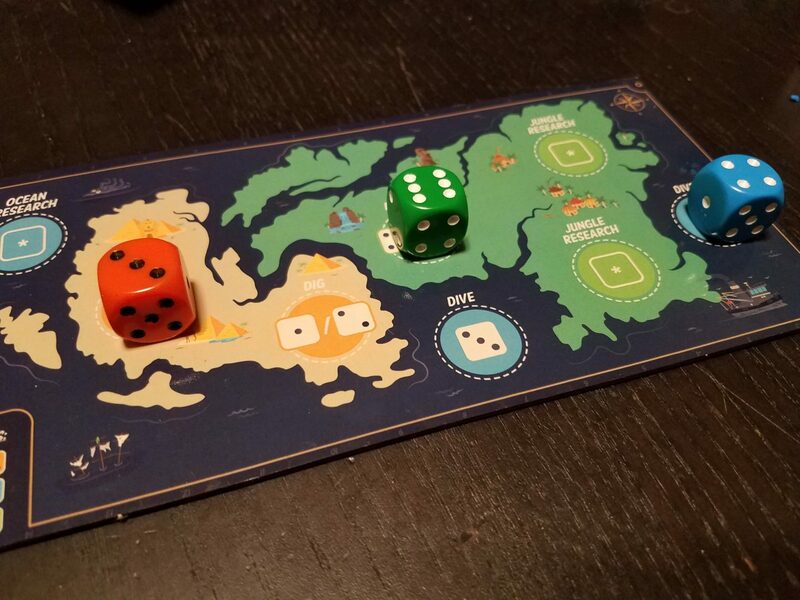 With each roll of the dice, there is the omnipresent threat of raiders (lost arks need not apply). Should you ever roll 3 or more Raider symbols, regardless of what you are working on, you will bust. If you bust 3 times on one track, you are permanently locked out of it for the rest of the game! Jess: I have to admit, this really bummed me out. Of course there has to be a penalty for busting, but I’m already losing a turn – it feels a little lousy to get punished on top of that by potentially losing out on a third of the game. Andrew: I hear you there, but the end of the game is signaled by one player no longer being able to make progress in their search, so at least a 3-bust lockout gets you much closer to the end of the game. 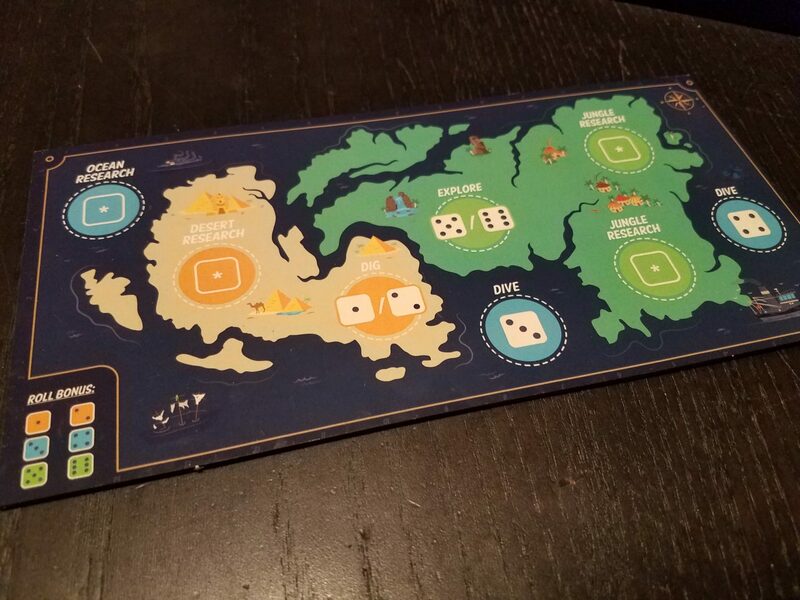 Ancient Artifacts is a relatively straightforward game. 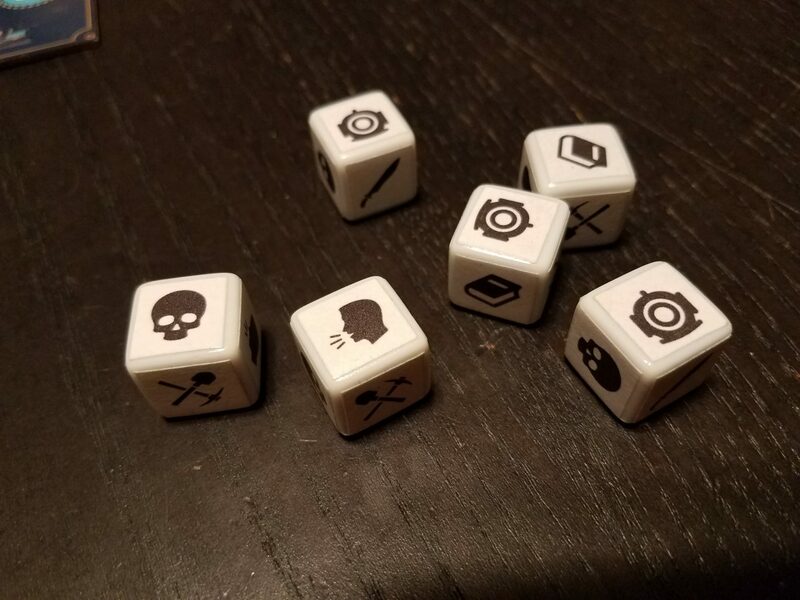 The push-your-luck element of the Results dice is simple enough – each roll toward your goal makes it that much more likely you’ll bust, but you do have the buffer of your cash reserves to let you re-roll those raider symbols (at least until you either run out of capital or roll 3 of them all at once). Obviously there is a lot of luck involved here – even determining which career track you’re going to work on is dependent on which of the Action dice you draw from the bag. With a real string of bad luck, your treasure-hunting career will never quite get off the ground, while good luck will see you sailing through. Andrew: That said, the variety of rolling challenges does serve to keep things interesting and engaging – I really loved that some tasks simply couldn’t be completed in a single roll no matter how lucky you were, so that you had to come back and chip away at those challenges. Jess: Yeah! I also really like any game that encourages players to care about each other’s turns, and the follow mechanic in Ancient Artifacts means that if your opponents are super-lucky, well, they can work for you! Andrew: Overall, I enjoyed Ancient Artifacts. I really like the quick honeycomb of rolling challenges it presents. My only gripe with it, really, was that sometimes the Action dice will unkindly stop you from making any sort of progress (even before you pick up the Results dice). I get it – being able to just work on any of the tracks you wanted would remove a layer of complexity, but just like your critique of the triple-bust rule, I didn’t enjoy being done out of a turn before it even started. Jess: Yeah, that’s not the best. 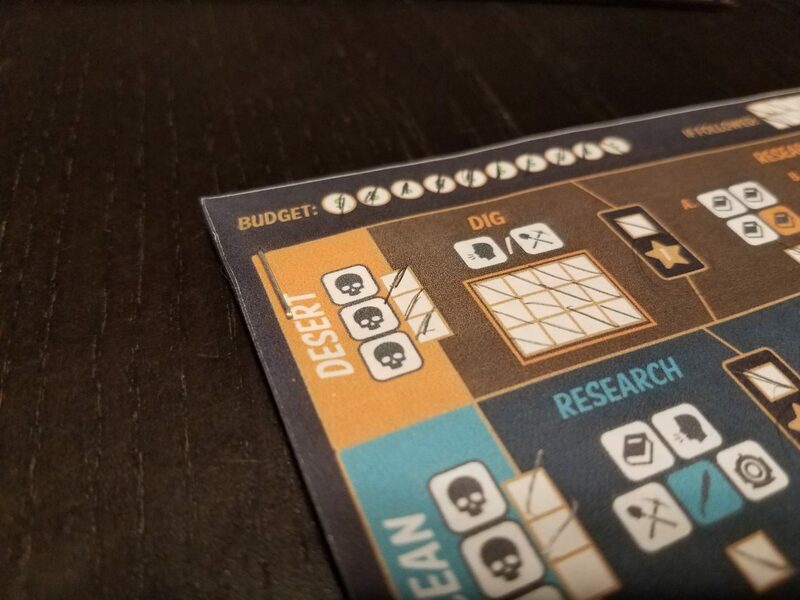 I think you liked this one more than me – I wanted a little more out of the theme, but like I said before, it sure is a looker, and I can’t resist a roll and write with some clever mechanics. Ancient Artifacts hits those notes, even though I wish it was a teensie bit more forgiving in some ways. The Ancient Artifacts Kickstarter is on now, and chugging along. If you’re interested in a quality (if occasionally tough) roll and write for your collection, we absolutely suggest going over to the campaign and checking it out! Next Post:Conan RPG GM Screen & GM Toolkit Release!